The latest update to the popular chemical 3D modelling and visualisation tool ChemDoodle 3D is out. 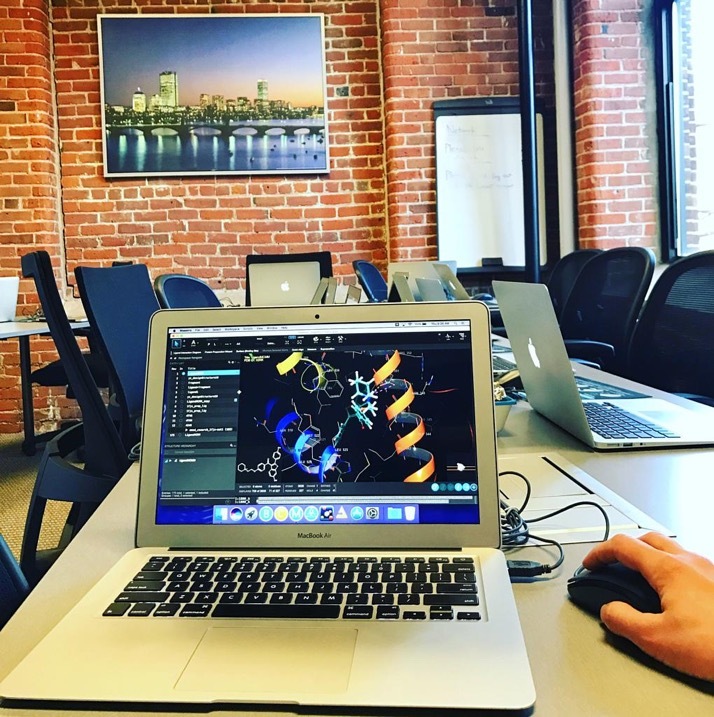 ChemDoodle® 3D is a molecular modeling and scientific visualization platform with a focus on user customizability and universal support. Just like its 2D counterpart, all of the graphics are fully customizable and controllable. The large feature set is well organized for intuitive access and we develop ChemDoodle 3D to work with the vast majority of graphics cards in use. 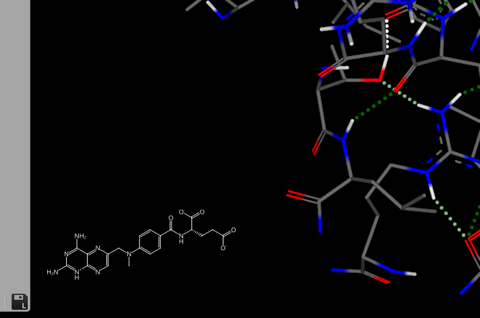 Major update to the molecular modelling engine. A very accurate implementation of the MMFF94 and MMFF94s force fields can now be used by the Minimizer widget when building molecules. Generation of armchair/zigzag/chiral carbon nanotube geometries. Significant improvements to the MMTF interpreters, fixing all reported and known issues. Improvements to the CIF interpreters to read a wider range of files. Also fixed a centering issue with CIF input. Cresset provide a variety of software packages to support small molecule design, built on the foundation of their extended forcefield XED forcefield. When I first reviewed a couple of Cresset products FieldView, FieldAlign and Forge the forcefield was only applicable to small molecules. However the forcefield has been constantly developed and can now be applied to proteins. Flare Version 2 is a recent extension to the portfolio with the introduction of Electrostatic Complementarity (EC), i.e. a comparison of electrostatics on both the small molecule ligand and the target protein DOI. Electrostatic interactions between small molecules and their respective receptors are essential for molecular recognition and are also key contributors to the binding free energy. Assessing the electrostatic match of protein-ligand complexes therefore provides important insights into why ligands bind and what can be changed to improve binding. Ideally, ligand and protein electrostatic potentials at the protein-ligand interaction interface should maximize their complementarity while minimizing desolvation penalties. In addition Flare version 2 includes a new Python API, that allows users to automate tasks by scripting, but also integration with other Python packages such as RDKit cheminformatics toolkit, and Python modules for graphing, statistics (NumPy, SciPy, MatPlotLib), and Jupyter notebook integration. 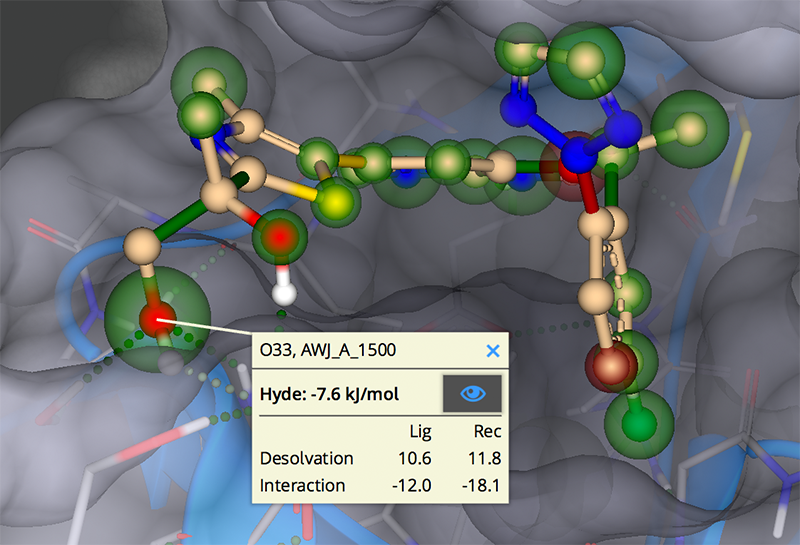 Flare gives access to a very powerful set of tools designed to aid ligand binding, docking, electrostatic modelling and WaterSwap, all within a well thought-out interface. The storyboard feature also allows the user to store snapshots of progress and coupled with the log acts like a notebook. Worth noting there is an updated Version of Flexera License Manager. MOE now uses an updated version of the Flexera license manager. The license manager server components lmgrd, chemcompd, and lmutil have all been updated to version 11.16.0.0. Note that older versions of MOE will continue to run with updated license manager servers. LICHEM is an open-source (GPLv3) interface between QM and MM software so that QM/MM calculations can be performed with polarizable and frozen electron density force fields. Functionality is also present for standard point-charge based force fields, pure MM, and pure QM calculations. Note, On OSX machines, the SEDI, TEX, BIB, and CXXFLAGS variables will need to be modified. I just noticed GROMACS 2019 was released on Dec 31 2018. Simulations now automatically run using update groups of atoms whose coordinate updates have only intra-group dependencies. These can include both constraints and virtual sites. This improves performance by eliminating overheads during the update, at no cost. Intel integrated GPUs are now supported with OpenCL for offloading non-bonded interactions. PME long-ranged interactions can now also run on a single AMD GPU using OpenCL, which means many fewer CPU cores are needed for good performance with such hardware. The tutorials will be given a series of outstanding experts Christian Lemmen (BioSolveIT), Akos Tarcsay (ChemAxon), Giovanna Tedesco (Cresset), Dan Ormsby (Dotmatics) Greg Landrum (Knime ) and Matt Segall (Optibrium), you will be able to install the software packages on you own laptops together with a license to allow you to use it for a limited period after the event. ChemAlive (www.chemalive.com) would like to offer ConstruQt, its core molecular design tool based on quantum mechanics (QM), for trial. The last bullet point is worth noting, so don't submit anything confidential. Detailed installation notes are in the documentation (page 5). On MacOS machines, to leverage OpenMP multicore execution, you must install a gcc (g++) version different from the one provided within the compiler front end “Clang” which until now has not built-in support for OpenMP. You might install gcc with the command: ‘brew install gcc -- without-multilib’ (see for instance https://stackoverflow.com/questions/35134681/installing- openmp-on-mac-os-x-10-11). This way, the compiler might be installed somewhere like /usr/local/Cellar/gcc/7.1.0/bin/g++-7. In this example, make sure the g++-7 command be available with your PATH and adjust the IGMPlot makefile accordingly (changing the g++ command with g++-7 for instance). This link might also be useful OpenMP under MacOSX. 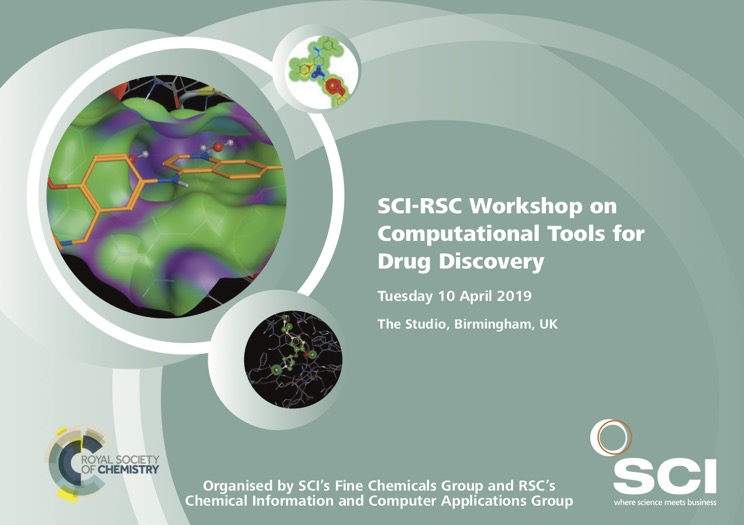 The Open Force Field Consortium, an academic-industry collaboration designed to improve small molecule force fields used to guide pharmaceutical drug discovery. Molecular Graphics and Modelling Society Young Modellers’ Forum 2018. Date: Friday, 30th November, 2018 Venue: Room QA063, Queen Ann Court, The Old Naval College, Greenwich Location: Details of how to get to the campus can be found at http://www2.gre.ac.uk/about/travel/greenwich. 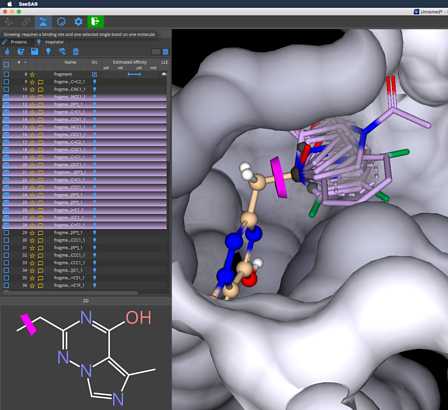 The 2018.01 release of Chemical Computing Group's Molecular Operating Environment (MOE) software includes a number of new features, enhancements and changes. I written a review that highlights a number of the features. Conformational analysis is a critical component of molecular modelling and I've always viewed OMEGA from OpenEye as the standard to which all other software packages should be compared. OMEGA's knowledge-based approach produces high-quality conformers, superior to those of many other methods. It has also been found to be the fastest of commercially available conformer generators. Benchmarking Conformer Ensemble Generators, Friedrich, N.-O. de Bruyn Kops, C. Fachsenberg, F. Sommer, K., Rarey, M. Kirchmair, J. J. Chem. Inf. Model. 2017, 57, 2719-2728. DOI. OMEGA’s capability has been expanded for molecules containing large rings by adding a method specifically tuned to sample macrocyclic conformational space. The approach is based on a rewritten version of the original OMEGA distance geometry algorithm. In this update support for macOS El Capitan (10.11), macOS Sierra (10.12), and macOS High Sierra (10.13) has been added. Windows XP (finally!) and macOS 10.6 have been removed from the list of officially supported platforms. Supported Windows platforms are Vista/7/8/10, and the minimum supported macOS is 10.7 (Lion). Amber14:EHT Forcefield. The Amber14 parameter set is now supported in MOE. The new parameters consist of improvements to nucleic acids; otherwise, protein and small molecule parameters (and charges) are unchanged. The forcefield can be selected in the MOE | Footer. TCR-MHC Protein Complex Database. A new MOE Project database containing T-Cell Receptor (TCR) – Major Histocompatibility Complex (MHC) x-ray structures has been added to MOE. The database can be accessed with MOE | Protein | Search | TCR-MHC | TCR-MHC which will launch the MOE Project Search panel. Descriptor calculations with the SVL function QuaSAR_DescriptorMDB. Energy minimization in the Database Viewer DBV | Compute | Molecule | Energy Minimize. Conformational search using MDB input files in MOE | Compute | Conformations | Search. Rotamer library generation with DBV | Compute | Build Rotamer Library. Project database creation with the SVL run file dbupdate.svl and the scripts $MOE/bin/projupdate and $MOE/bin/projupdate.bat. I plan to review the latest version of MOE in the near future. Core replacement This feature is the same but with a much improved UI. You are able to directly select and visualize the bonds that will be clipped to carve out a core fragment for replacement. The clipped bonds now remain in place (even while you define sphere constraints) up until you define a new query. Also the display of results is much enhanced, as you can see the new core fragments highlighted in 2D as well as in 3D. For reference, your query molecule stays visible as well. Fragment linking and merging You may of course launch the Inspirator with more than just one molecule. In this case, you can define bonds to clip on different molecules, thereby requesting linker fragments that will connect the remaining pieces. Note that it is not mandatory to clip a terminal part of each molecule to create the query, you may replace a core part in one and connect it to another fragment at the same time. You can download SeeSAR here and use it for free for 7 days. The official release of GROMACS 2018 is now available. 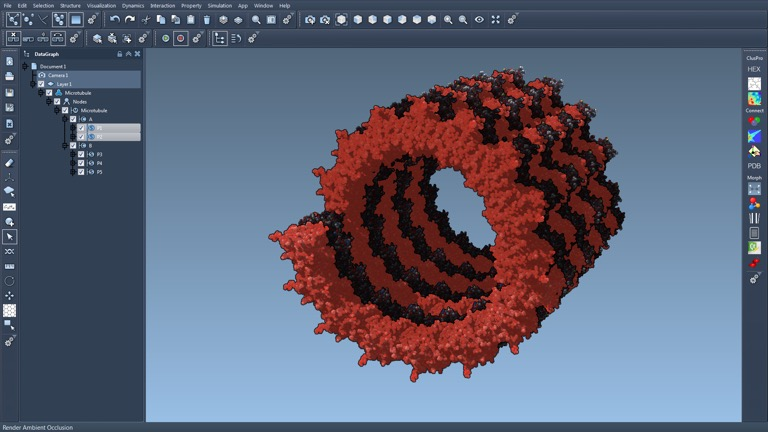 GROMACS is one of the major software packages for the simulation of biological macromolecules. PME long-ranged interactions can now run on a single GPU, which means many fewer CPU cores are needed for good performance. Optimized SIMD support for recent CPU architectures: AMD Zen, Intel Skylake-X and Skylake Xeon-SP. The AWH (Accelerated Weight Histogram) method is now supported, which is an adaptive biasing method used for overcoming free energy barriers and calculating free energies (see http://dx.doi.org/10.1063/1.4890371). A new dual-list dynamic-pruning algorithm for the short-ranged interactions, that uses an inner and outer list to permit a longer-lived outer list, while doing less work overall and making runs less sensitive to the choice of the “nslist” parameter. A physical validation suite is added, which runs a series of short simulations, to verify the expected statistical properties, e.g. of energy distributions between the simulations, as a sensitive test that the code correctly samples the expected ensemble. Conserved quantities are computed and reported for more integration schemes - now including all Berendsen and Parrinello-Rahman schemes. I see that SeeSAR now supports a parallelized 'real' fragment growing. SeeSAR is a software tool for interactive, visual compound prioritisation as well as compound evolution. Structure-based design work ideally supports a multi-parameter optimization to maximise the likelihood of success, rather than affinity alone. Having the relevant parameters at hand in combination with real-time visual computer assistance in 3D is one of the strengths of SeeSAR. Stimulating exploration with SeeSAR, we have embarked on pursuing a new cheminformatics compute paradigm of "Propose & Validate". An interesting publication in JCIM, Atom Types Independent Molecular Mechanics Method for Predicting the Conformational Energy of Small Molecules, DOI. We report herein our effort to incorporate lone pairs into our model to extend its applicability domain to any saturated small molecules. The developed model H-TEQ 2 has been validated on a wide variety of molecules from polyaromatic molecules to carbohydrates and molecules with high heteroatoms/carbon ratios. SeeSAR 6.1 has been released, looking at the release notes there are a couple of useful additions. Multiple protein alignment, Since version 5.6 it has been possible to load and work with multiple proteins. So far this feature could only be utilized with pre-aligned structures. Now you can do the 3D alignment in SeeSAR itself. The alignment is based on and optimized according to the superposition of related active sites. Therefore, once you have selected a binding site, just one click is all that is needed to superpose all related binding sites at once. Note that the superposition is limited to highly homologous proteins (>90% sequence identity). SeeSAR/StarDrop interface. We have implemented a new function that greatly improves the interaction between the two software packages. Using the option in the molecule table toolbar, you may now transfer all (or the subset of favorite) molecules directly to StarDrop, which is launched automatically. This interface is supported in StarDrop starting with the recently released StarDrop version 6.4 and StarDrop now analogously supports launching and submitting data to SeeSAR. So it is in fact possible to transfer data back and forth and exploiting maximum synergy to make the best of both worlds. Note that this feature may require a few adjustments in your SeeSAR settings to become fully functional. Shortcut to copy protein ligands. Usually among the first tasks after loading proteins is to copy the related protein ligands to the molecules table for further processing (docking, editing, re-scaffolding, etc.). Especially with multiple proteins this turned out to be a quite cumbersome procedure. Therefore we have implemented a shortcut function in the toolbar of the proteins tab to copy all protein ligands at once to the molecules table. Note that this function will copy all ligands irrespective of their position in relation to the common binding site that is used in the context of the molecules table. So some of the copied ligands may lie well outside the common binding site. The Schrödinger small molecule discovery suite has ben updated. This looks to be a substantial update and is described in the video below. Just looking at the release notes for ADF2017 and support pages and a couple of things caught my eye. The python distribution shipped with ADF was upgraded to python 3.5. Among others, new and updated modules include the iPython interpreter for easier development of python codes, a number of useful packages such as numpy 1.11.3 / scipy 0.18.1, ASE 3.13.0, matplotlib and RDKit 2016.09. The Mac OSX version no longer requires XQuartz and is much faster in visualizing large systems. We are proud to announce the 2017 release of the ADF Modeling Suite, with excellent contributions from our collaborators and the continued efforts of the SCM team in Amsterdam. The latest update to ORCA has just been released. The program ORCA is a modern electronic structure program package written by F. Neese, with contributions from many current and former coworkers and several collaborating groups. The binaries of ORCA are available free of charge for academic users for a variety of platforms. 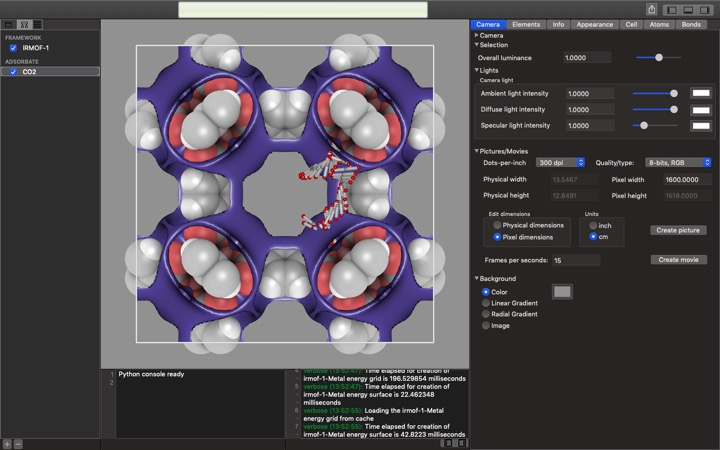 ORCA is a flexible, efficient and easy-to-use general purpose tool for quantum chemistry with specific emphasis on spectroscopic properties of open-shell molecules. 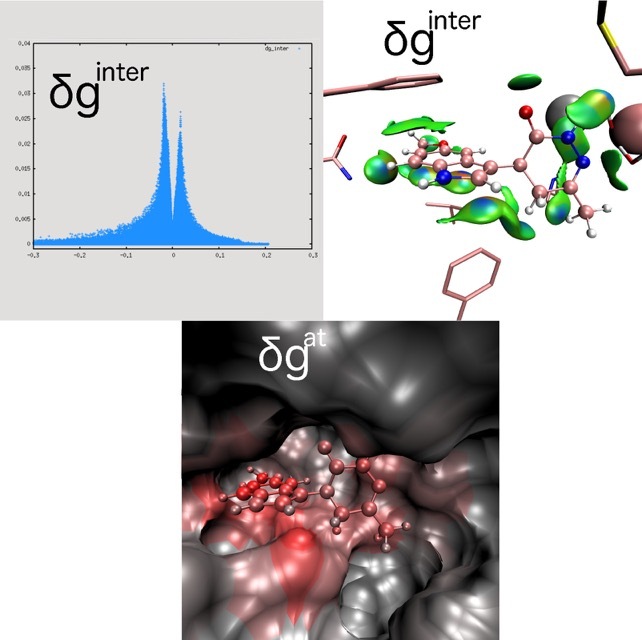 It features a wide variety of standard quantum chemical methods ranging from semiempirical methods to DFT to single- and multireference correlated ab initio methods. It can also treat environmental and relativistic effects. Due to the user-friendly style, ORCA is considered to be a helpful tool not only for computational chemists, but also for chemists, physicists and biologists that are interested in developing the full information content of their experimental data with help of calculations. Chemical Computing Group have announced and update to MOE. 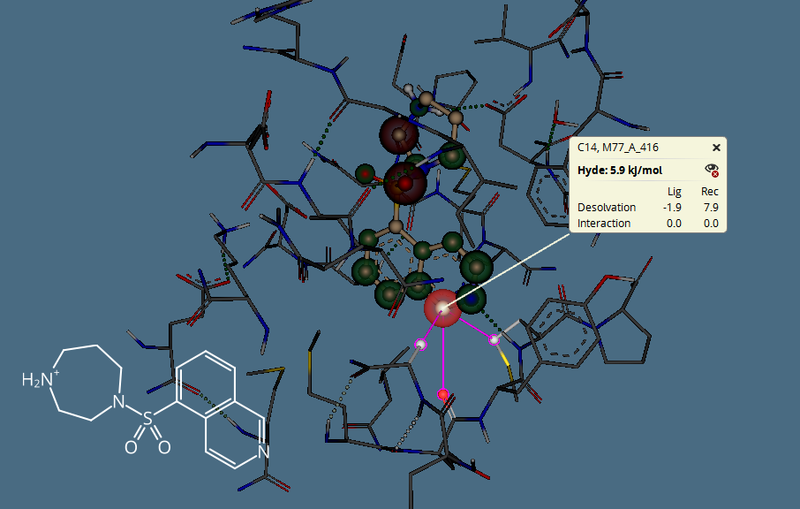 The MOE 2016.0802 update contains a number of updates to the biomolecule modelling including improved hydrogen bond detection, and addition of a number of unnatural amino acids. There have also been improvements to MOE/Web MOE/web. The MOE/web version compatibility check has been broadened. MOE/web license waiting has been improved. HTTPS authentication proxy server support has been improved. 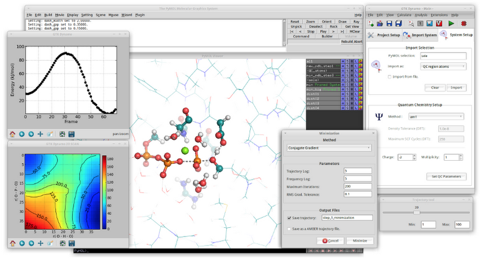 The TINKER molecular modeling software is a complete and general package for molecular mechanics and dynamics, with some special features for biopolymers. TINKER has the ability to use any of several common parameter sets, such as Amber (ff94, ff96, ff98, ff99, ff99SB), CHARMM (19, 22, 22/CMAP), Allinger MM (MM2-1991 and MM3-2000), OPLS (OPLS-UA, OPLS-AA), Merck Molecular Force Field (MMFF), Liam Dang's polarizable model, and the AMOEBA (2004, 2009, 2013) polarizable atomic multipole force field. TINKER 8 is a major new release of the Ponder Lab tool set for molecular mechanics and dynamics calculations. An important change in this new version is the switch from old-style common blocks to Fortran modules. Use of modules and greatly increased use of dynamic memory allocation means TINKER can now support very large molecular systems. TINKER 8 also implements improved OpenMP parallelization throughout many parts of the code. Additional big improvements include parallel neighbor list building and updating, and big reduction in iteration needed to converge AMOEBA polarization via an efficient PCG solver. Other changes from the previous TINKER version include new and updated force field parameter sets and numerous minor additions and bug fixes, many of them suggested by users of the package. Please note that as with prior new releases, version 8 is neither backward nor forward compatible with earlier versions of TINKER. In particular, older versions of parameter files should not be used with TINKER 8 executables and vice versa. A nice image from the Maestro 11 training session run by Schrödinger, it looks like there are a few more training sessions coming up also. Maestro 11 is the portal to all of Schrödinger's computational technology – far more than just a user interface, Maestro 11 also helps researchers organize and analyze data. MolSoft have announced the release of ICM version 3.8-5. 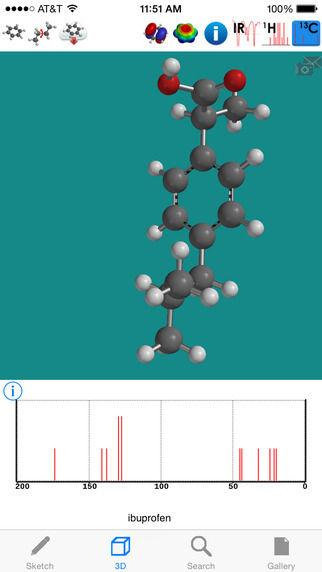 Generate a 2D Interaction Diagram of a ligand with the binding pocket. The image is annotated with hydrogen bonds and interacting residues. Chemical Computing Group have just announced an update to MOE. This release has fixed a couple of Mac OSX 10.12 (Sierra) issues but also brings a host of new features. A more detailed description of the new and enhanced features in MOE 2016.08 can be found at http://www.chemcomp.com/print/moe2016.08.pdf. The latest version of APBS includes several notable features and bug fixes. This release includes the addition of Poisson-Boltzmann Analytical-Method (PB-AM), Poisson-Boltzmann Semi-Analytical Method (PB-SAM) and the Treecode-Accelerated Boundary Integral Poisson-Boltzmann method (TABI). Additionally, we have made improvements to the build system and the system tests, as well as miscellaneous bug fixes. Poisson-Boltzmann Analytical Method (PBAM, see Lotan & Head-Gordon) and Semi-Analytical Method (PBSAM, see Yap & Head-Gordon) integrated with APBS. PBSAM is currently only available in the Linux and OS X distributions. Examples are located with the APBS examples in the pbam/ and pbsam/ directories. More information and documentation may be found in the PBAM and PBSAM sections of the APBS-PDB2PQR website. Included NanoShaper alternative to MSMS. Added binary DX format support to the appropriate APBS tools. Test suite amended and expanded. Removed hard-coded limitation to number of grid points used to determine surface accessibility. PBSAM not building in windows due to C standard restrictions in the Microsoft compiler implementation. 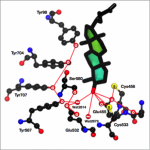 A great publication on Open Source Molecular Modeling. 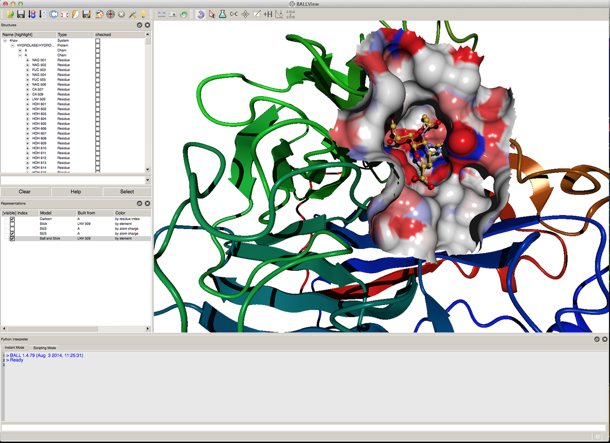 The success of molecular modeling and computational chemistry efforts are, by definition, dependent on quality software applications. Open source software development provides many advantages to users of modeling applications, not the least of which is that the software is free and completely extendable. In this review we categorize, enumerate, and describe available open source software packages for molecular modeling and computational chemistry. An updated online version of this catalog can be found at https://opensourcemolecularmodeling.github.io. From toolkits to desktop applications a fantastic and comprehensive listing. An interesting post on chemistry and computers, Pymol and very large PDB files. The Zika Cryo-EM structure as a case study. Always good to see people stress testing computational tools. Facio is a free GUI for computational chemistry softwares (TINKER, MSMS, Firefly, Gamess, MOPAC and Gaussian). A new version of PDB2PQR has been released. Added alternate method to do visualization using 3dmol. Added compile options to allow for arbitrary flags to be added. Helps work around some platforms where scons does not detect the needed settings correctly. Added a check before calculating pKa's for large interactions energies. OSX binaries require OSX 10.6 or newer. The OSX binary is 64-bit. 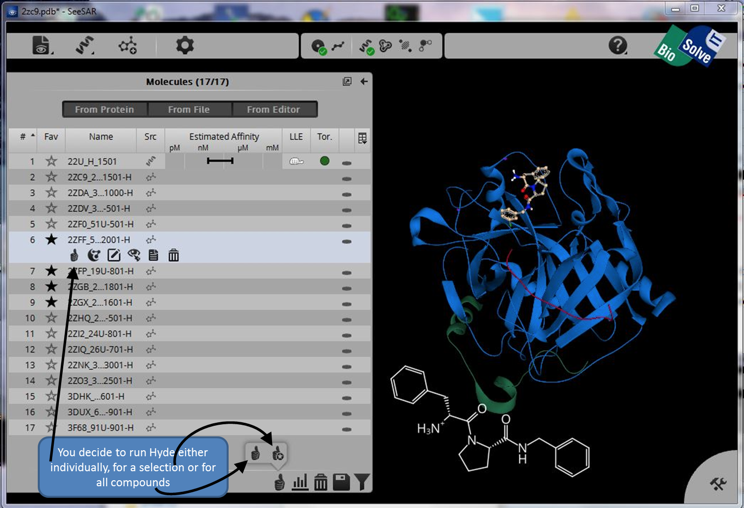 You now control when the compute-intense Hyde-calculation runs, this means large sets of molecules can now be loaded, analyzed and processed (e.g. filtering, calculating properties) before the intensive affinity calculations are run. Version 4.2 comes with a load of minor improvements, particularly for the command line use. The full release notes are here. I've been following this software since it was first released and there is a review here, every update brings useful features. It is well worth downloading the free 1 week trial to have a look at. Software for Chemistry & Materials (SCM) is an Amsterdam-based computational chemistry software company. 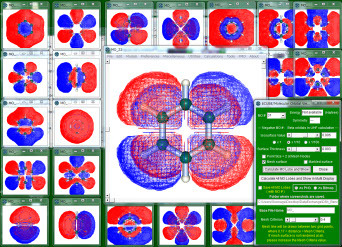 Originally spinning out from the Vrije Universiteit as Scientific Computing & Modelling NV in 1995, the SCM team supports and develops the ADF Modeling Suite, centered around the flagship program Amsterdam Density Functional (ADF), which was originally developed in the 1970s in the theoretical chemistry department. Added NCIPLOT to the alphabetical listing of applications. 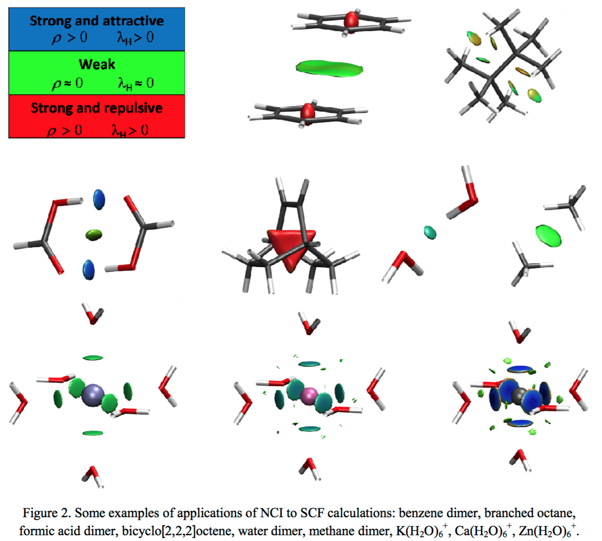 NCI (Non-Covalent Interactions) is a visualization index based on the density and its derivatives. It enables identification of non-covalent interactions. NCIPLOT is available for download. Our approach reveals the underlying chemistry that compliments the covalent structure. It provides a rich representation of van der Waals interactions, hydrogen bonds, and steric repulsion in small molecules, molecular complexes, and solids. Most importantly, the method, requiring only knowledge of the atomic coordinates, is efficient and applicable to large systems, such as proteins or DNA. Across these applications, a view of nonbonded interactions emerges as continuous surfaces rather than close contacts between atom pairs, offering rich insight into the design of new and improved ligands. Erin R. Johnson, Shahar Keinan, Paula Mori-Sanchez, Julia Contreras-Garcia, Aron J. Cohen, and Weitao Yang, J. Am. Chem. Soc. 2010, 132, pp 6498-6506. J. Contreras-Garcia, E. R. Johnson, S. Keinan, R. Chaudret, J-P. Piquemal, D. N. Beratan, and W. Yang. J. Chem. Theory Comput. 2011, 7, pp 625-632. Sampling conformational space is a key requirement for several areas of ligand design in small molecule drug discovery. A recent paper BCL::Conf: small molecule conformational sampling using a knowledge based rotamer library DOI describes a new conformational search method. The project homepage provides a download, supports Mac OSX 10.4 or higher. I'll write a review in the New Year. I just thought I'd flag a recent paper on sampling conformation space DOI. The interaction of a small molecule with a protein target depends on its ability to adopt a three-dimensional structure that is complementary. 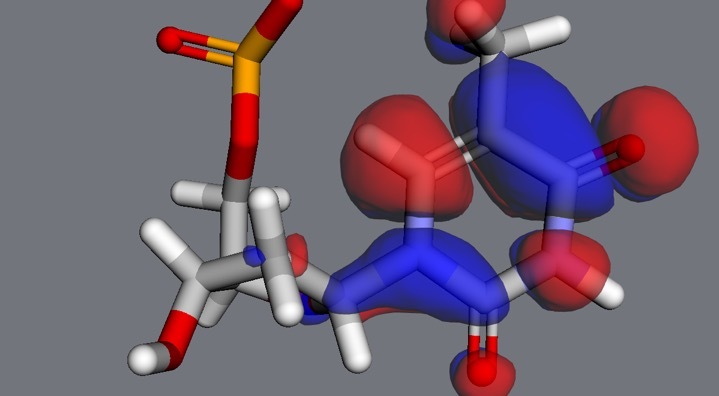 Therefore, complete and rapid prediction of the conformational space a small molecule can sample is critical for both structure- and ligand-based drug discovery algorithms such as small molecule docking or three-dimensional quantitative structure–activity relationships. The PLIP Protein-Ligand Interaction Profiler has been updated. The web service includes all the updates and integrates BioLip for flagging biologically relevant interactions. Since ligand molecules (e.g., Glycerol, Ethylene glycol) are often used as additives (i.e., false positives) for solving the protein structures, not all ligands present in the PDB database are biologically relevant. MOE2014.0901 Update is now available. 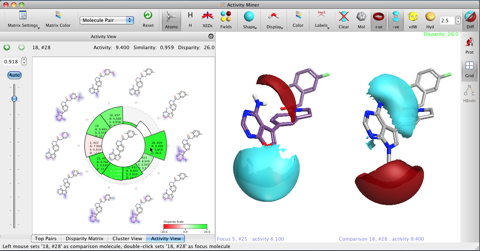 MOE is a fully integrated molecular modelling and drug discovery software package. PDB2PQR 2.0 which is now available from http://www.poissonboltzmann.org/docs/downloads/. Option to automatically drop water from pdb file before processing. Integration of PDB2PKA into PDB2PQR as an alternative to PROPKA. Support for compiling with VS2008 in Windows. Option to build with debug headers. PDB2PKA now detects and reports non Henderson-Hasselbalch behavior. Can now specify output directory for PDB2PKA. Improved error regarding backbone in some cases. Improved error catching on web interface. For more information see APBS & PDB2PQR: Electrostatic and solvation properties from complex molecules. 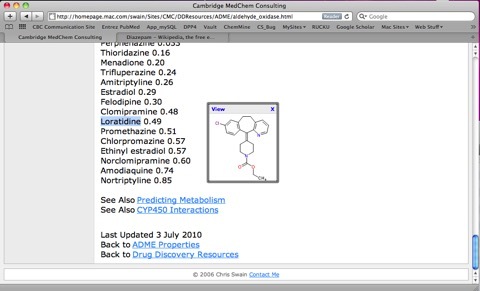 MOE is a software system designed to support Cheminformatics, Molecular Modelling, Bioinformatics, Virtual Screening, Structure-based-design and can be used to build new applications based on SVL (Scientific Vector Language). Improved table: pM affinity, in/exclude multiple columns, the pose-specific context-menu, quick-find molecules including a 2D popup rendering, this can be very useful when trying to work out the structure from a 3D conformation. A new production release of UCSF Chimera (version 1.10) is available. Platforms: Windows, Mac OS X (including Yosemite), Linux. This will be the last release to support OS X 10.6 and 10.7. New since version 1.9: Protein contact maps color-coded by distance, PDB biounit and CATH domain web fetch, plotting all-atom and backbone RMSDs along sequence alignments (previously only alpha-carbon RMSDs), update to AmberTools 14, "vop scale" density map normalization, Modeller dialog allows specifying distance restraints, further implementation of the MultiDomain Assembler homology-modeling pipeline. More details are given below; see release notes for the full list: http://www.rbvi.ucsf.edu/chimera/docs/relnotes/1.10.html. Thank you for your collaboration in helping us to test the beta version of the FORECASTER Suite 2014. From your feedback and bug reports, we have now released the final version of the Suite. The files were updated and posted on the download page. Please send us any bugs that you might have not yet reported. The FITTED docking tool was initially been developed as a suite of three programs: SMART (used to prepare the small molecules for docking), PROCESS (used to prepare the protein files for docking) and the docking program FITTED. More recently, these three programs together with several others have been integrated into a single package, namely FORECASTER. The ADF modeling suite consists of the GUI, the powerful DFT codes ADF (molecules) and BAND (surfaces, bulk), the semi-empirical DFTB and MOPAC2012 modules, ReaxFF, and COSMO-RS. The binaries for the entire suite work out of the box, in parallel, on all popular platforms (Windows, Mac, Linux). You might want to have a look at a new website that I’ve just been sent details of. OEToolkits 2014.Jun This release of the OpenEye toolkits is focused on stability and new platform support. The last release, 2014.Feb, was a major feature release introducing numerous new features. This release focused on fixing many bugs and improving the overall stability of the OpenEye toolkits. Mac Users should note this release will be the last release to support OSX 10.7. Unfortunately there is no 2D display of ligands in the ligand list so sometimes it can be difficult to keep track of modifications. Well, in keeping with the “fast and agile” release plan a update is now available that includes a 2D display. 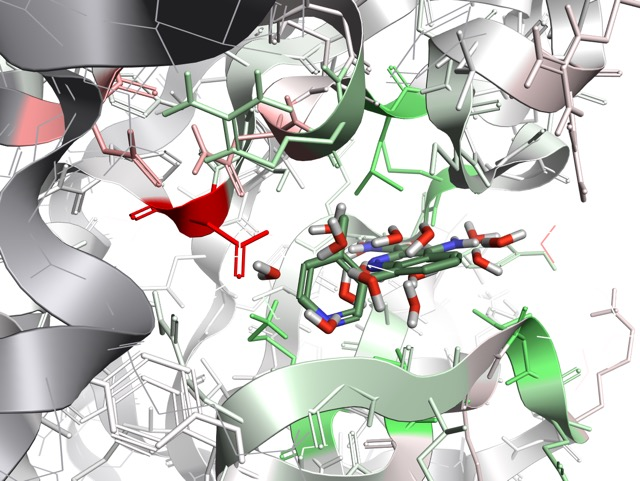 SeeSAR is an interesting new product from BioSolve-it, it is intended as an interactive tool for designing/improving ligands for drug discovery. I’ve written a brief review that you can read here. This is a really interesting application, it seems a little rough around the edges but the developers have released it early are very keen to get feedback. I found them very responsive and enthusiastic about getting the views of users involved in how the application evolves. I would certainly encourage people to download it and use the free trial period to give it a go, and provide them with feedback. There are more software reviews here. 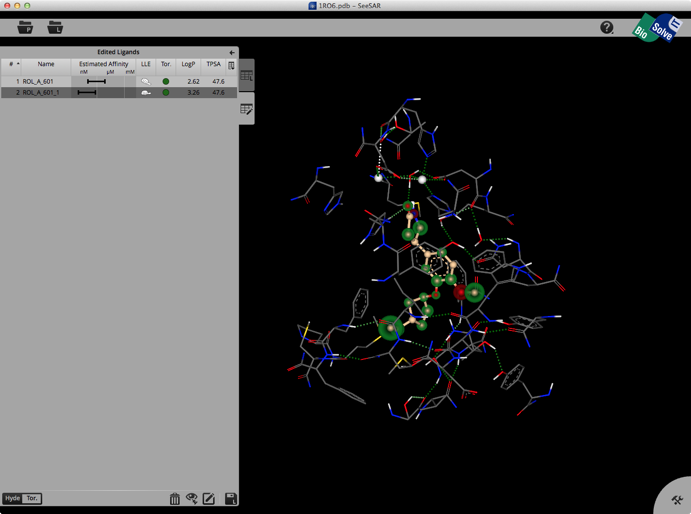 DOT is a software package for docking macromolecules, including proteins, DNA, and RNA. DOT performs a systematic, rigid-body search of one molecule translated and rotated about a second molecule. The intermolecular energies for all configurations generated by this search are calculated as the sum of electrostatic and van der Waals energies. These energy terms are evaluated as correlation functions, which are computed efficiently with Fast Fourier Transforms. In a typical run, energies for about 108 billion configurations of two molecules can be calculated in a few hours on a few desktop workstations working in parallel. Version 1.9 of UCSF Chimera has been released. Multiple sequence alignment using Clustal Omega or MUSCLE web services. Building double-helical nucleic acids,"colorkey" command, "struts" command to reinforce structures for 3D printing, "vseries" volume series playback and processing options,more efficient save/restore of coordinates in sessions, Dynameomics amino acid rotamer library, WMV2 movie output, COLLADA export. There is an interesting publication in the latest issue of Chemical Biology and Drug Design describing, Chem-Path-Tracker An automated tool to analyze chemical motifs in molecular structures DOI. 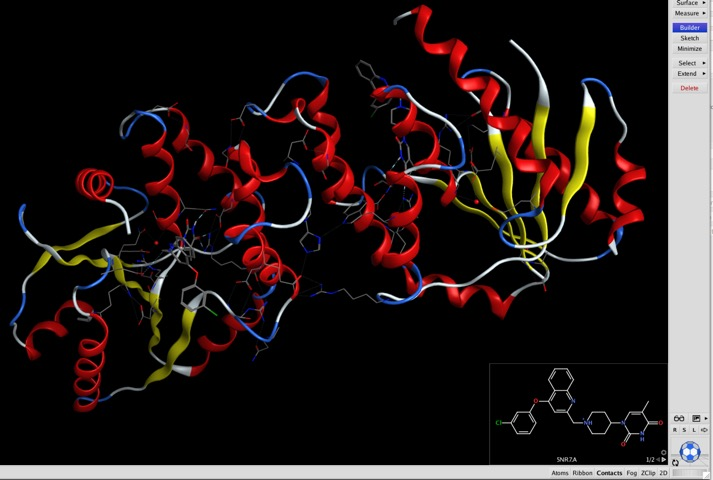 This is a plugin for the molecular visualisation tool VMD that allows the user to highlight and reveal potential chemical motifs with a protein using only a few selections. Force fields: Amber has two new fixed-charge protein force fields, ff14SB and ff14ipq, a new modular lipid force field, Lipid14, and updates to nucleic acid and carbohydrate force fields. Improved options for self-guided Langevin dynamics and accelerated molecular dynamics, to enchance sampling along soft degrees of freedom. More features from sander have been added to pmemd for both CPU and GPU platforms, including performance improvements, and support for extra points, multi-dimension replica exchange, a Monte Carlo barostat, ScaledMD, Jarzynski sampling, explicit solvent constant pH, GBSA, and hydrogen mass repartitioning. Support is also included for the latest Kepler, Titan and GTX7xx GPUs. Expanded methods are available for free energy calculations that change Hamiltonian models, including better procedures for appearing and disappearing atoms, and tighter integration with replica-exchange simulations, and a new absolute free energy method. New facilities are present for using electron density maps (e.g. from cryo EM/ET experiments) as constraints, and to support rigid (or partially flexible) groups in simulations. Amber Tools have also been updated. 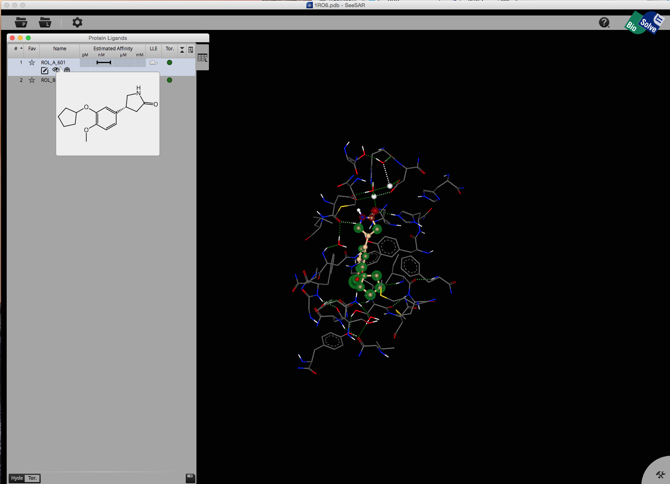 GTKDynamo is free/open source software which, together with pDynamo, transforms PyMOL into a powerful interface for molecular modeling. The interface has been designed to facilitate determining reaction pathways in biological systems, specially using hybrid QC/MM (or QM/MM) methods. Pure QC simulations - ab initio and SMO. Pure MM simulations - using AMBER, CHARMM or OPLS force fields. Reaction path calculations - using NEB. A little while back I posted a comment on the Apple SciTech list asking about options for stereoscopic viewing of molecular modelling on a Mac. Many thanks to those who contacted me directly, it seems there are a number who have suffered the trials and tribulations of trying to set up stereo viewing. I suspect the combination of different graphics cards, driver, emitters, special connectors, special glasses, program software, X11, operating system changes means that this is a real pain to coordinate support., something always seems to get "updated" breaking everything else. Which is why this email from Stephan Keith caught my eye. Let me tell you my solution. It is not necessarily cheaper, but for me, a whole lot easier. I am a 3D software engineer, but I am seriously interested in stereoscopic 3D. I program in C, OpenGL and GLUT. I became weary of all the glasses, buffers, nVidia cards that didn't really work, emitters ... the whole mess. What I do, now, is I write my OpenGL software to create a sidexside or top over bottom stereo display that takes up the entire screen. I then connect an HDMI connector to my LG Stereo 3D Television. I turn on the Stereo3D, put on my RealD glasses. The S3D is passive, not active, so I don't get the annoying flicker, and I don't have to worry about nVidia 3D glasses running out of power (most annoying, at what was $185 a pop). No special glasses, no emitters, no special code, no special connectors. All .... Gone. I thought I’d try this out, so armed with a copy of MOE a MacBook Pro and a mini display port to HDMI cable I headed down to PCWorld in Cambridge to try it out (many thanks to the people at PCWorld who were really helpful). I first tried out an LG ELECTRONICS 27MT93V LG MT93V . The first thing I’d say is that the set up was trivial, from connection to viewing a protein in 3D was only a couple of clicks. This gave a good impression of a 3D protein structure, both in stick display to see side-chains and in cartoon display to see the overall structure of the protein, colours were excellent. However I found that it was necessary to sit facing absolutely in the centre of the screen to get a good display, also if you move close to the screen then the 3D effect is lost and you get jagged line artefacts. This might not be an issue for a TV but if you paln to use it as a computer monitor I suspect it might be a deal-breaker. I suspect it would be difficult to sit alongside colleagues and have them all have a good 3D impression. I then tried an active 3D display on a Samsung UE46F6800 46-inch Widescreen TV , this was much larger than I needed but I understand there are smaller models available. Once again setup was a breeze, this gave a good impression of a 3D protein structure, both in stick display to see side-chains and in cartoon display to see the overall structure of the protein, colours were excellent, and the brightness did not seem to be impacted at all by the active glasses. The 3D viewing was acceptable at a wide range of screen angles and distances and it should be possible to sit beside colleagues to discuss a project and all have a good 3D view. I wear prescription glasses and I found the active glasses fitted comfortably over my glasses. They were also a lot more lightweight than I remember in the past. In the past active shutter glasses have been very expensive but prices have dropped significantly. Personally I found the Active 3D much superior, especially if you planning to use this mainly as a computer monitor rather than a TV that you view from the comfort of your sofa. Whilst the update to PYMOL was announced as part of the Schrodinger update I thought it deserved a separate blog entry. The Schrodinger Small Molecule Drug Discovery Suite was updated over the weekend, this is a major update that brings in a host of new features and improvements. There are also updates to the Biologics Suite and the Materials Science Suite. MolSoft have announced that a new version of ICM is now available for download from the support site . A description of the key new features can be found on the news page and release notes. To help you get to know the new features we will be holding a free webinar next week (2/11) - we hope you can join us, please register here. Chemical Computing Group have just announced an update for MOE. CCCPP: Computes Cavites, Channels, Pores and Pockets in proteins. CYL: Minimal radius enclosing cylinder. Minimal radius circumscribed cylinder. DIVCF: Selects by clustering major conformations of a molecule in a set of its conformers. MCG: Optimal Partition (classification): numerical variables and non-euclidean spaces. The number of classes is computed. POP: Optimal Partition (classification): categorical variables. The number of classes is computed. POSE: Computes the RMSD between two ligand poses. No rotation translation is performed. VIRAPOPS: A forward simulator dedicated to rapidly evolved viral populations. Binaries are available for MacOSX and Linux. I was just reading the end of year newsletter from [Molsoft] and I came across this interesting snippet. MolSoft is excited to announce that Anaglyph 3D is now available to use in ICM and iMolview. Sure enough the update on Dec 24th has this in the release notes. Anaglyph stereo mode is added. (Set 'Stereo Type' to 'Anaglyph' in Tools menu) Any red-cyan 3D glasses will work in this mode. I think this is the first app to enable this sort of stereo viewing and it just underlines the strides that mobile platforms are making in scientific computing. For science apps for iOS have a look at the mobile science page. The details are described in a recent publication Journal of Cheminformatics 2013, 5:46 DOI, it can be downloaded from Sourceforge, and you can try it out on the CH5M3D website. I’ve added CPMD to the alphabetical listing of applications. CPMD is an ab initio electronic structure and molecular dynamics (MD) program using a plane wave/pseudopotential implementation of density functional theory (DFT). It is mainly targeted at Car-Parrinello MD simulations, but also supports geometry optimizations, Born-Oppenheimer MD, path integral MD, response functions, QM/MM, excited states and calculation of some electronic properties. Full installation instructions are available on the website together with the user manual and examples. The examples can run effectively on an Intel Core i5 (2.53 GHz, OS/X) with 4 GB of available memory (most of tests require ca. 1GB, few more). Nonetheless, references have been generated on an IBM Blade power7 (with 8 mpi tasks and 1 OMP task per CPMD run) with 64 GB of available memory. Estimates of the execution time and memory requirements will be given based on this more performant setup. CPMD is free for non-profit organisations. SYBYL-X 2.1.1 is now available, the focus of this release is to extend the capabilities available via the standalone PYTHON interface to 3D-QSAR, which was introduced in SYBYL-X 2.1 earlier this year. The PYTHON API allows 3D-QSAR models (CoMFA, CoMSIA, and Topomer CoMFA) to be created and used for predictions outside of SYBYL-X. Hologram QSAR (HQSAR) is a now available via Python. HQSAR has been successfully applied to generate predictive global QSAR models for on- and off-target effects and models for important ADME related properties; the HQSAR method employs 2D-substructural counts as descriptors. Similarity computations and similarity searches (UNITY 2D fingerprints) are now accessible via Python to support various workflows, such as lead expansion, lead hopping, and cluster analysis. Chemical Computing Group have just announced the release of the latest update of MOE (Molecular Operating Environment). Core System Enhancements (with 64-bit support) The default versions of MOE for Linux, Windows, and Mac OSX are now all 64-bit. The current release also includes 32-bit versions for each architecture. OS X Dock Icon Enhancements. A new Dock menu, accessed by right-clicking (or control-clicking) the MOE Dock icon, allows for standard Mac OS X operations – Hide, Show, and Quit – across all open iterations of MOE. The Dock Menu also contains menu items in order for users to view the About panel bundled in MOE, as well as access the Preferences panel. Additionally, the Dock indicator light under the MOE Dock icon remains persistent after having launched a new instance of MOE, until all opened MOE instances have been closed. Users continue to be able to drag and drop compatible MOE documents (i.e. .pdb, .svl, etc.) onto the Desktop and/or Dock icons for direct opening in MOE. New Preferences Menu. A new Preferences panel allows for certain parameters to be set and/or changed graphically. These parameters include the defaults key and path to MOE, the current configuration of MOE (32- or 64-bit, or Auto-select), as well as a selection of common command line tags, with a custom section for inputting other command line options. Output Continuity. stdout and stderr received from MOE have been standardized to be displayed in a native panel in a scrollable text box. Activity Miner from Cresset is a new tool designed to rapidly interrogate and decipher SAR in both Torch and Forge. Activity Miner is intended to help identify key elements of the SAR by starting from a set of aligned molecules and then automatically comparing them to each other.